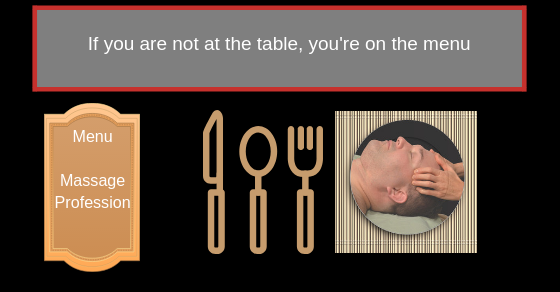 You are here: Home / Massage Insurance Billing / If we are not at the table, we are on the menu. If you are not at the table, you are on the menu is a political saying that supposedly comes out of WA DC in about 2000 with no known origin. I first heard it said that the Alliance for Massage Therapy Education Conference (I think in about 2010) in Tuscon AZ by John Weeks, publisher/editor of the Integrator Blog News and Reports. What it means is that if you/we don’t have a seat at the table with the insurance carriers, insurance commissioners, hospitals, doctors, nurses, legislators in every state, legislators in WA DC – we will be on the menu. You will have other agencies, politicians, insurance companies creating policies, rules, laws and you won’t have a say in creating allowable fees, benefits and policies. For example: one of the biggest issues we are having currently in WA state is that the insurance companies are drastically reducing allowable fees. The insurance companies set allowable fees using formulas that consider the amount of work the provider does(time and intensity), liability insurance costs and practice expense data. The insurance companies do not have any data on practice expense from the massage profession so they just guess and use their own data. We haven’t had any association representing us with the insurance carriers. In terms of having massage therapy covered by health insurance, it is clear that there is a movement calling for massage therapy to be involved in fixing the Opioid epidemic. Comprehensive Accreditation Manual for Hospitals: The Official Handbook of the Joint Commission on Accreditation of Healthcare Organizations (JCAHO), updated in August 2000, recommends massage as a non-pharmacological therapy that can be used successfully in pain management. ABMP believes Section 2706 provides additional justification for insurance companies to reimburse massage therapists. For example, when massage therapy is a covered benefit of a health plan, it is not uncommon for an insurance company to reimburse massage provided by a physical therapist, chiropractor, or osteopathic doctor – but not massage therapy provided by a massage therapist. Evidence shows that massage therapy, especially when performed by a massage therapist, is a cost-effective delivery method of health care. pain, etc),the massage therapist is eligible for reimbursement, so long as that provider is licensed by his or her state and can treat the condition within his or her scope of practice. AMTA of course said they did not want massage therapy to be covered under the ACA. See Laura Allen’s blog post. citing that 50% of their members did not want that to happen. What about the other 50% that did? Feb 2017. American College of Physicians recommends massage therapy for back pain. IF this does not get us moving, I don’t know what will. Let’s get to the table. Whether you like it or not, whether you want it or not, massage therapy will most likely be covered by health insurance….eventually….or so it seems with so many calling for it’s use. The thing is that we are not at any table at all. We do not have associations stepping up to the table to be our voice. It is important to start having these conversations NOW so that the massage therapy profession can bring our message to the table and create what we want as far as benefits and allowable fees. We need to be at the tables in each state with insurance commissioners, health care insurance carriers, and in state capitals where laws are being created. Otherwise it will be too late and we will be handed the leftovers. 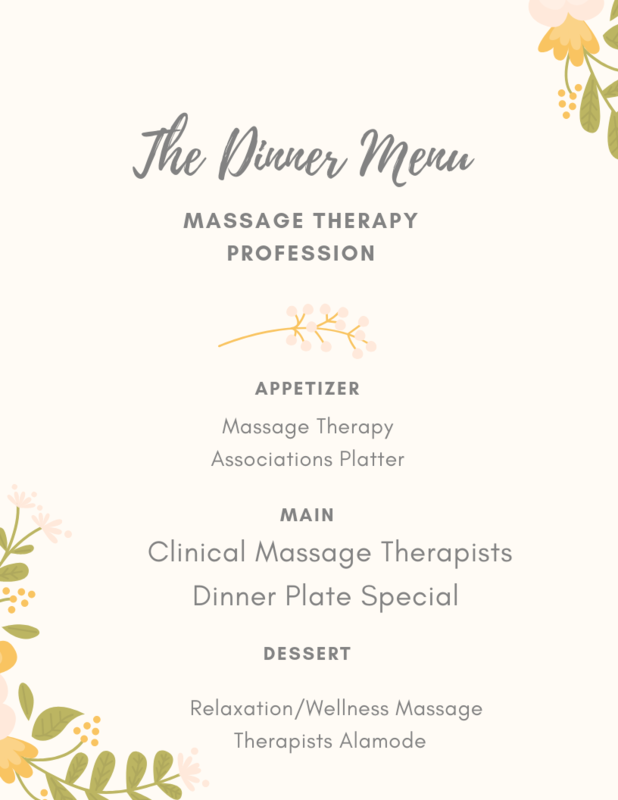 To be at the table means that the massage therapy profession needs to attend meetings with State Insurance Commissioners offices, be talking to state and national health insurance plans and be involved in all efforts to help combat the Opioid epidemic. To get to the table requires making connections like the one that started it all here in WA State. The Insurance commissioner back in 1992 was Deborah Senn, who also had an office assistant who was also a massage therapist (Lori Belinski – now Lori Grassi who is the executive director of the WA state chiropractic association and lobbyist for the same group). We need legislators in office at the state and national level that support massage enough to create laws that will make it so massage therapy is covered by health insurance. We need state and national lobbyists and political action committees. WA State has one of the of the only Political Action Committees that I know of in the US – the WA Massage Alliance for Health (www.wamah.org). We also have a person in the house of representatives, Shelly Kloba, that has been a massage therapist for over 20 year and sponsored a bill in 2017 on prior authorization. There are some that also say that we need to up our education standards before anything can happen with insurance companies and laws…but I personally think that it is more an legislative effort because of watching what has happened here in WA. When the Every Category Law was created, WA MT’s were only required to have the minimum of 500 hours of education which was the norm at that time and still is the basis for licensing in many states. Do we need more evidence as many MT say? I personally don’t think so based on what I have seen. We do have enough evidence right now to get started. More is coming out every day. We don’t have to wait any longer. We just need people to step up and sit at the table for us. Health care specialists (Lawyers, healthcare executives) who know how to deal with insurance companies to negotiate contracts and help us determine the best ways to talk to insurance companies. Do we need physicians networks or clinically integrated networks like some hospitals/physicians are moving to so that they can negotiate contracts while also providing health care services that are paid based on their results (values based care) instead of just fees for services? Massage awareness networks that work to educate doctors, legislators and insurance carriers on just what massage therapy can do. (It is clear to me that the insurance companies still see massage therapy as a burden and think that they have to pay out the $25k or more for surgeries or thousands in drugs rather than using massage to eliminate those costs.) We do not have enough data on things like how much is massage therapy saving the insurance companies. The only thing we do have is the report from AMTA on Integrative Care and Pain Management. Political Action Committees for every state and One National one. PAC’s raise money to help get the right candidates into office that support massage therapy. Learn to bill insurance NOW so you can start to understand the issues at hand and start learning about how insurance works so we can have more therapists and clients behind the people we get at the table. There is power in numbers. 350k + massage therapist and their clients = ????????? ?